Retail Sales - This dataset shows annual retail sales at 13 types of retail establishments. Data are from the Census of Retail Trade, a part of the quinquennial Economic Census. Easy Analytic Software Inc. (EASI) uses its statistical modeling technology and geographic profiles to show this data for census tracts and block groups. Benchmark data are updated and projected 5 years forward based on County Business Patterns and other sources. Clink on the links below to view DataSheets comprising statistical abstracts complete with infographics of indicators describing demographic characteristics and behavior patterns of US consumers created in Data Planet Statistical Datasets. Log in to explore the data at even more granularity - as well as relationships between these statistics and other indicators in the vast Data Planet repository. In reviewing the samples below, identify the question(s) the data answers for marketing and entrepreneurial initiatives. 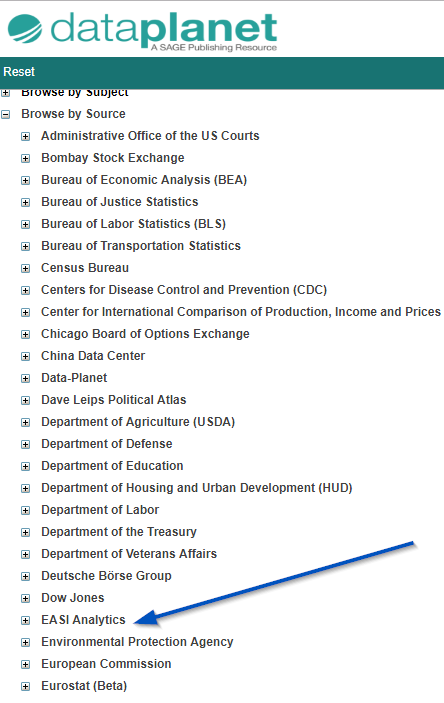 To see if your library subscribes to any of these modules, look in the indicator panel (the panel on the left side) in Data Planet Statistical Datasets. If available at your library, you will see the datasets listed both by Subject and Source, as below.